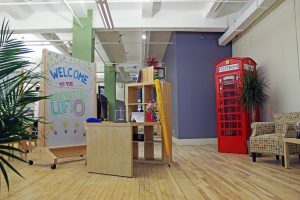 Innovative Open House at the Innovation Loft NYC | UNLEASH YOUR TEAM’S POTENTIAL! The Innovation Loft held an innovative open house on Thursday, June 26th! Participants had the chance to take a tour of our creative space, network with other creative decision makers, as well as partake in creative thinking and innovative games based on time compressed exercises that generate rapid brainstorming. Visitors enjoyed this immersive brainstorming program to get a feel for our our ideation processes and methods. Thank you for all of those who stopped by! Be on the look out for more of our events! Visit Innovative Evenings at the Innovation Loft for a brief and informative look into our most recent networking event. If you have any other inquiries about our space or services, please don’t hesitate to email info@innovationloft.com or give us a call at 646-692-3522.